Registration has now closed for the 2018 USMS Spring National Championship in Indianapolis, Indiana, that will take place May 10-13. 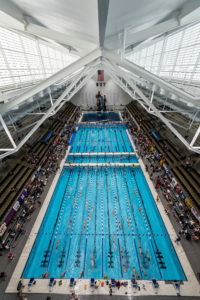 The event will be hosted by Indy Aquatic Masters at the amazing IU Natatorium. 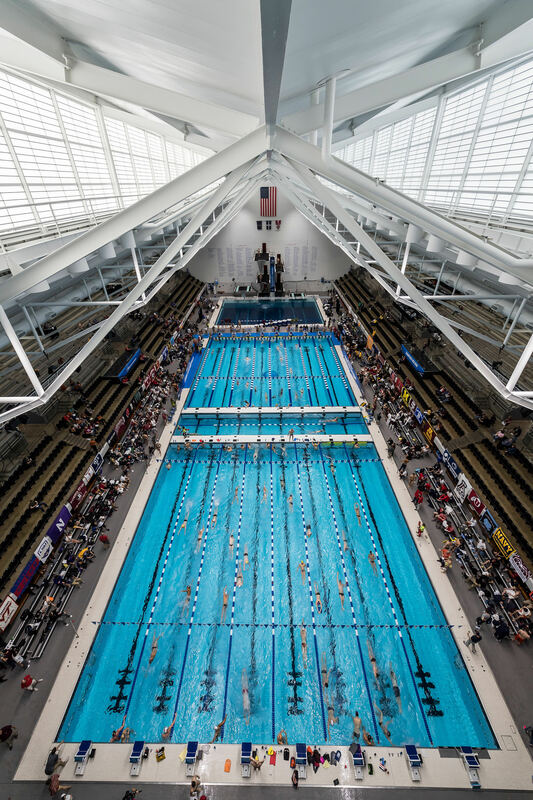 The facility has seating space to accommodate 5,000 people, which is a very good thing since this meet sets a new record for number of participants at any USMS National Championship event with 2,388 swimmers entered. This record number of swimmers is a testament to the awesomeness of the facility. The indoor facility will run two eight-lane 25-yard competition courses. The pool is 9 feet deep at the ends and 10 feet in the center. The water temperature is kept at a competition-perfect 79°F and there will be nineteen 25-yard lanes of space available for warm-up at all times in two different pools. I’ll be serving as Head Coach for the Oregon team, and Sara Shepherd will be the assistant coach. This is Sara’s first time serving as a coach at Nationals and I’m very much looking forward to working with her. This will be my 3rd Nationals as Head Coach of Oregon and my 4th Nationals serving as a coach in some role. Oregon club (OREG) will be represented by 20 swimmers: James Adams, Karen Andrus-Hughes, Erin Cavender, Anna Daggeett, Alice Fasbender, Barry Fasbender, John Foges, David Hathaway, Michael Kelber, David Kilburn, John Kinder, Willard Lamb, Allen Larson, Matt Miller, Sandi Rousseau, Sara Shepherd, Margaret Toppel, Robert Voll, Joy Ward and Cynthia Werhane. With that lineup from Oregon, it will be interesting to see how many Oregon, Zone and National records are set by our swimmers. I would guess that quite a few records will fall to Oregon swimmers over the 4-day meet. And with 20 swimmers, Oregon will have some fun relay options as well. It is really great to see some youth traveling to Nationals from Oregon this year! Anna Daggett and Erin Cavender, both in the 18-24 age group, will be participating in their first USMS National Championship meet. Entering new age groups this year, I suspect that Karen Andrus-Hughes (60-64), Robert Voll (60-64), Allen Larson (65-69), Michael Kelber (70-74), Sandi Rousseau (70-74), Margaret Toppel (70-74) and Joy Ward (75-79) all have their eyes set on age-group best times, Oregon records, Zone records or possibly even National records. One Oregon swimmer to pay particular attention to is Willard (Wink) Lamb. Following up on his record-setting performance in August at Summer Nationals in Minneapolis where he took out all 9 of the freestyle and backstroke world records for the 95-99 age group, Wink will be looking to set National records (only the US swims short course yards, so there are no world records for SCY) or improve upon his National records (assuming he gets some at PNA SCY Champs and Oregon Association Champs) in his new 95-99 short course yards age group. Be sure to stay tuned to see how our Oregon swimmers represent us at 2018 USMS Spring Nationals in Indy.